Designed to educate, enlighten and empower people to respect the past, “Claim the Dream” dramatically portrays the dream of freedom, justice and equality for all. Audiences are transported across time as each character is colorfully communicated through dramatic monologue, dance, music, slide presentation and audience participation. 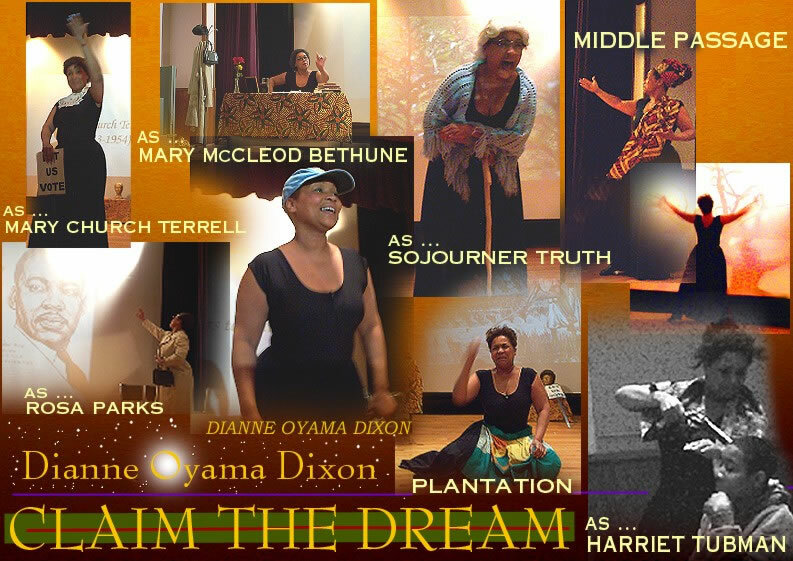 “CLAIM THE DREAM” is a chronology of noted female Black leaders including depiction’s of slavers, Harriet Tubman’s underground railroad, Sojourner Truth’s Ain’t I A Woman?, Mary Church Terrell’s right to vote speech, Mary McLeod Bethune’s last will and testimony, and Rosa Parks’ bus ride. Ms. Dixon authored “Ladies, Your Places Please” which appeared at Nashville’s Circle Theater. She has produced, directed, written and performed in hundreds of television and radio commercials that have aired in all markets as well as internationally. The Alfred State community loved Dianne’s performance. Claim the Dream was thought provoking, inspirational and empowering for the faculty, students and staff in attendance. People are still talking about the performance. Thanks. The performance by Ms.Dixon was amazing. Words cannot be expressed for the wonderful job that she did. Please tell her thank you very much. I just wanted to let you know that Dianne’s performance went great. We had a 90+ crowd, which is quite substantial for this campus. Please pass on our thanks and appreciation to you, your staff, and Dianne herself. We will definitely keep Contemporary Issues Agency in mind for future events. The show went great- Dianne used the space to her advantage- it is an open space but she “filled” it well. The students were very attentive- as this is our student center, many come and go, but there was a definite group of students who stayed for the whole show and were very much captured. Surprisingly, it was a large number of males who stayed the whole time. The committee was happy with the show and enjoyed it.